Sit a spell and view all the colors we currently have available to dye. Also read the stories behind the colorways as most of them are named after places and sayings common to Missouri. Missouri is rich in culture whether you like opera, ballet, theater, art galleries, concerts or just a night out with the gang there’s sure to be something to entertain you. This purple is all about being pampered and ready for that fun night out on the town. Pair your favorite outfit with a beautiful shawl or cowl in this gorgeous purple and your ready to go. Ask for directions in the Ozarks, and you won’t get anything that will show up on Google Maps. A place may be “over yonder,” “down the road,” “up the hill,” or “a stone’s throw away.” A few shades darker than Ash Grove, A Stone’s Throw is another neutral grey that will cause our rich tonals to pop even more. Ash Grove, Missouri is a tiny town that has as its claim to fame as being the birthplace of the notorious Ma Barker. Not quite so sinister, this pale grey yarn is reminiscent of the ashes left as the campfire burns out after the roasting of hot dogs and s’mores on a cool summer night. It’s a lovely neutral that pairs well with many of our brighter, complementary colorways. “Toyland, Toyland happy and girl and boyland! While you dwell within it you are ever happy there!” During the Christmas season we all pull out those classic Christmas movies that make you feel good inside and remind you of Christmas when you were little. Babes in Toyland was just one of those movies. We hope this cheerful colorway feels you with such feelings that you are ever happy knitting! Part of our spring wildflower collection. The bluebird is the Missouri state bird. When we think of bluebirds we often think of the phrase “the bluebird of happiness” and they are referred to as a symbol of happiness due to the bright blue that is on their backs and wings and the cheery song that they sing. Missouri had many early French settlers who left their mark in the names of towns, villages, lakes, and rivers. Unfortunately, as the dialect has been dying out, native Ozarkians have some, well, let’s say unusual, pronunciations for these French words, and they’ve stuck. Thus, the small community of Bois D’Arc, Missouri is correctly pronounced “Bo Dark.” Although Bois D’Arc is named for the Bois D’Arc or Osage Orange tree that produces hedge apples in the area, we felt that the colorway inspired by the name simply had to be – dark. This yarn is gunmetal grey with black, and would be a great contrast to one of our jewel tones. Candy Corn Gone Wild is an ode to one our favorite things about fall and Halloween-CANDY CORN! 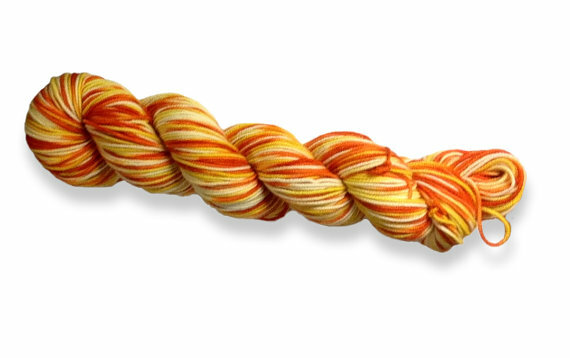 There are hundreds of candy corn on this skein and while we wouldn’t make recommend you try to eat them, they sure do look tasty. In our late night brainstorming sessions the fuel that keeps us going is caffeine, one of the more delightful forms are Chocolate covered espresso beans. A handful of those bitter sweet beauties covered in dark, milk and even white chocolate help keep the ideas flowing and the energy up to keep playing and planning the next awesome colorway. With shades of brown from the dark roasted beans all drenched in decadent chocolate, no matter your taste preference this colorway has them all. On a clear summer night the sky isn’t black its teaming with color; deep, dark blue, smokey greys and hints of grey blue and yes some black. This colorway represents those beautiful night skies. Grab a blanket, your favorite cuppa and lay out and look at the beauty and wonder that surrounds us at night. If you want grab your head lamp too and take your knitting needles for double the fun on a clear summer night. Missouri’s Current River is a popular river for float trips. At almost any time of the year conditions on the river are float worthy even if a might bit chilly. Fed by many natural springs, the Current is one of the clearest rivers you will ever see and always just a little cold, great for a dip on those hot summer days. The reflection of the clear blue skies and the greens of the various trees along the river are mirrored in this beautiful yarn. We’re quite fond of our Missouri sports teams around here, so why on earth would our first sports inspired colorway be from Chi-Town? It’s simple. One of our favorite customers asked us to create this color just for her, and we loved it so much that it had to become part of our roster. We just couldn’t cut it, ya know? This awesome dark, navy blue was a definite score! The Devil’s Ice Box is a cave in Rock Bridge Memorial State Park in Columbia, Missouri. At 6.25 miles long it is one of the largest caves in the state, and is home to variety of wildlife. This cave is a place to cool off and explore. This blue is a chilling blue that will help you chill. Part of our Japanese Stroll Garden Inspiration series and Stroll Garden Mini Skein Set. Dogwood Canyon Nature Park is comprised of 10,000 acres of the Ozarks natural wilderness. With walking and biking trails, waterfalls, rivers, and wildlife, it’s a wonderful place to spend time soaking in the scenic beauty. But if you can’t make it Dogwood Canyon yourself, you can spend time with its namesake yarn. The tonal pinks are like the blossoms of some of the dogwood trees, with the darker areas representing the branches of our state tree. 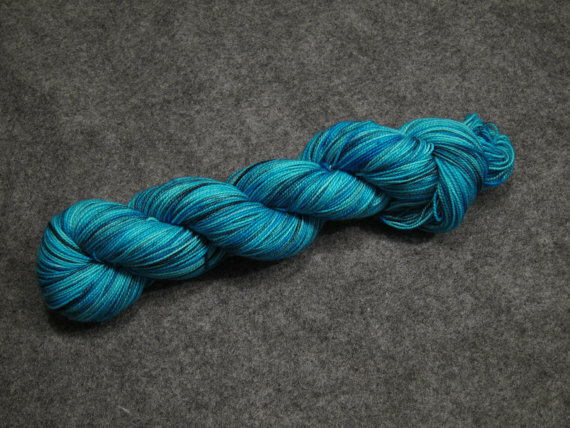 This yarn goes great with our Bois D’Arc colorway. Elephant Rocks is names after the rock formations in Belleview, Missouri in the Elephant Rock State Park. If you ever get to see these rock formations you will see how much they look like elephants. This tonal grey yarn is a medium grey and is a great color to use in conjunction will all of the other tonal colorways we have available. What are little girls made of? sugar and spice and everything nice of course. And little boys? well they are made of snips and snails and puppy dog tails. If you have little ones in your life you know just how true this little rhyme is. These colorways inspired by this well known nursery rhyme evoke all the little girl and total boy joys of childhood. Let that inner kid out and knit some fun into your day. Frostbite reminds us of the bitter bite of winter, with its icy blues and the dark skies. It also might look like what happens if you go outside unprepared. Keep those fingers and toes warm this winter with Frostbite! Frosted Lemonade is another super bright color for the summer. Knit something with this color under the shade of a tree that will make you feel cool and refreshed just like a fresh cup of lemonade on a summer day! What was that around the corner? Perhaps a goblin darting passed? Spooky hints of Halloween colors peek through our ghostly pale yarn in Ghostly Hallows. Tread carefully and watch your step and be sure to come prepared with the appropriate ghost fighting weapons- knitting needles and a skein of ghoulishly fun yarn! We’re flashing back with more childhood memories! This colorway just makes us happy! It has the perfect combination of colors to go with your crimped fluffy hair and big bangs! Pull out those slouchy shirts, mini skirts and leggings, cuz girls just wanna have fun! This color brings memories of childhood and swimming at the local pool or at the hotel you stayed in during vacation. That reflective aqua blue water, the tiles in shades of blues and purples such happy memories of hours spent just having fun. The jello legs when you finally did exit just long enough for dinner. How long can you hold your breath? 🙂 This color makes us happy and coordinates well with Girls Just Wanna Have Fun as well as our other new variegateds. Looking at the varying shades of cocoa brown in this lovely yarn, you can almost see the melted chocolate being smoothly poured into an artisan bar. Springfield is home to one of the premier chocolate makers in the world, and we’re proud that this yarn is an homage to chocolate that is truly life-changing. Grape Slushie is another summer colorway that brings to mind great memories. We remember getting to stop at the little gas stations either after school or on a hot summer day and mom letting you get that special treat. While grape may not have been your flavor of choice, we hope this purple is the perfect flavor for you! Greene County is named for of one of the areas where we live or we have all at one point lived in. Greene County is a tonal green with a lot of depth of shade that really lends to its vibrancy. It reminds of us of one of our dear friends, who has knit several green sweaters that we think are the perfect green. Heart of the Ozarks is a play on words. We do live in the Ozarks and the areas around here are fondly referred to as the heart or center of the Ozarks. Also, this red is deep, bright and dark, and makes us think of things like vampires and blood. Nestled in the Missouri River Valley is the quaint German community of Hermann. This picturebook village has been voted Missouri’s most beautiful town, and is famous for the many vineyards and wineries that call Hermann home. This gorgeous purple yarn is inspired by the grapes on the vine, and worthy to simply be called Hermann. Indigo Sky–a deep rich blue purple that will make you think of laying out in a field and watching the stars on a clear night. Missouri is filled with beautiful places to hike, explore, and to sit and relax all while soaking in the beauty of nature all around you. Johnson’s Shut Ins State Park is one of those places. There are marvelous caves to explore, water to play in or kayak, and trails to hike. This yarn reminds us of the beautiful river rocks with the gorgeous blue greens of the water and surrounding foliage just waiting for you to explore at Johnson’s Shut-Ins. We all remember those warm nights after dark and the screen door being covered in June bugs; it meant it was really summertime. This color reminds us the shimmery blue green bodies without the eww factor :), and also those fun nights as kids playing outside after dinner until dark. Christmas is a time for giving, and although not exclusive to Missouri, we’ve grown up with the volunteers ringing bells and collecting money for those less fortunate. Those red kettles are synonymous with sharing and hope. Just as hearing the first bell signifies the Season is upon us, we hope this lovely red tonal yarn will remind you of the true meaning of Christmas. Knee High to a Grasshopper is a common saying around Missouri. You might hear someone say “Why, I remember Billy doing that back when he was knee high to a grasshopper.” The tonal green is bright and yet has a dark side to it. Sitting on the front porch on a sunny and warm Sunday afternoon with your knitting, or crochet nearby just enjoying the quiet of the day with your family is a Missouri tradition. We hope this color brings happy warm summer thoughts that make your winter a little brighter. A big bowl of oatmeal with maple and brown sugar was a staple for breakfast growing up and a wonderful, comforting way to start the day especially when the sky was over cast and snow was in the air. This color with it’s warm oatmeal hues and flecks of melting dark brown sugar is sure to warm your senses and add that touch of comfort to your next project. The “Maple Leaf Rag” is associated with the city of Sedalia, Missouri, and was composed by Scott Joplin. It became the model for ragtime compositions. This color feels like fall to us. The colors seem to epitomize those big piles of leaves you might have jumped in as a child or remind you of walking through a trail lined with maple trees. This deep dark tonal green is named after Mark Twain National Forest, Missouri’s only national forest. The dark and light shades of green with a little bit of light and dark blues remind us walking through the forest with the different trees and catching that view of the sky through the trees. While not isolated to Missouri this colorway is inspired by the Midway at fairs and carnivals. Like all other states, Missouri has lots of fairs and carnivals in the summer time and the Midway is full of those bright colors from all the lights on the games and the prizes. This festive colorway is is mash up of all the colors we love and and glows just like neon lights! Like many states, Missouri has Christmas tree farms for everyone. Whether you visit a lot of pre-cut trees, or take your chainsaw or ax to chop your own on a fun, family adventure, there’s nothing like the excitement of picking the perfect tree. Whether it’s fir, spruce, or pine, which are all colors you’ll find in our Oh, Tannenbaum colorway, we hope your tree shines bright in your home. Pick up a skein, and you’ll almost be able to smell the evergreen forest. Nestled in the Ozark Mountains is one of the world’s top amusement parks, Silver Dollar City. While it provides family fun and entertainment year round, it’s never more magical than at Christmas time. With over 500 miles of Christmas lights, hot wassail and cocoa, Christmas carolers in authentic Victorian costumes, and live stage shows of holiday classics, walking through the entrance takes you back in time to a simpler era where the true meaning of Christmas is ever present. This variegated yarn evokes the traditional colors of Christmases past – with a perfect red and varying shades of evergreen. Dyed on our sparkly yarn, you can almost see the lights twinkling on the tree. Treat yourself to a unique vacation in Osage Beach, Missouri. Enveloped by the Lake of the Ozarks, this jewel of a locale is the perfect place for a special getaway. This colorway will make you want to stretch out on that wooden deck chair, squish your toes in the sand and water and just enjoy the beautiful breeze that comes off the Lake and soak up some sun. Weather you are running away to your favorite beach or enjoying a quiet staycation go ahead and knit yourself a pair of beachy socks. Ozark Jubilee was the first national TV show to feature country music’s biggest stars back in the day, and was filmed right here in Springfield. Red Foley had guests you may have heard of: Patsy Cline, Johnny Cash, and Eddy Arnold to name a few. Or how about Porter Waggoner, Brenda Lee, or Carl Perkins? Have you ever worked all day and were just exhausted? Well, that’s what the phrase Plum Tuckered Out is all about! This beautiful tonal plum has a lot to offer in the many shades of plummy purple that are displayed here. Ste. Genevieve is Missouri’s oldest town, established in the early 1700’s by French colonists this city is rich in history and beautiful French Colonial architecture. Among it’s more intriguing architecture is a unique Bavarian style castle that was constructed in the secluded hills outside of Ste. Genevieve and only recently open to visitors. With such a rich history, regal building, and home to several winery’s it only seemed right to name this equally rich and regal purple yarn Ste. Genevieve. Like our inspiration we hope you feel equally wealthy as you knit your own piece of history. Did you know that teal is not just a color, but also the name of some waterfowl? Here in Missouri, there’s a dedicated hunting season for the blue-winged teal, the green-winged teal, and the cinnamon teal. This fabulous teal-colored yarn has no restrictions, though. You’ll want to use it for your projects all year long! St. Louis Children’s Museum was the first fully interactive museum created just for children. It opened in 1979 and continues to delight children today. This amazing destination is filled with fun learning experiences that open up the magic in our every day world. Exhibits include a three story slide and electrically charged spheres that make your hair stand on end and that’s just the beginning. With primary colors prominently displayed this colorway represents all of the fun and excitement found at this museum. Knit a little excitement and fun into your day with The Magic House. Lewis and Clark with the help of Sacagawea blazed a trail across the United States and that trail spanned a great deal of the Midwest and Missouri. As indie dyers we hope to be trail blazers in the world of color! This beautiful colorway is inspired by nature, all those unexplored places a hidden cave and beautiful field of wild flowers untouched by man or maybe a bubbling stream filled with moss covered coppery colored rocks. So many beautiful colors are hiding in this skeins as you go off the marked path. Let this skein take you on a new journey to unexplored places. For being a landlocked state Missouri doesn’t lack for water. We have an abundance of rivers, lakes, waterways and natural springs. This colorway evokes thoughts of looking into the crystal clear waters and seeing all the life living below. It also brings to mind days spent by the rivers and lakes with the bright blue skies and the greens of the plant life all around.